After dropping Fred off in Seward for the bus to Homer, we returned to the train station the next day, to meet Les’s son Greg and his family, Greg sailed with us on our first attempt of the North West Passage in 2013, now he has returned to sail with his family on Arctic Tern for a holiday of a lifetime (his words not ours). Tentative plan to sail from Seward to Valdez, visiting as much of Prince William Sound as possible. Settling everyone on board we left Seward that afternoon the weather forecast good for the next couple of days, not much wind for sailing, but good flat conditions to leave Resurrection bay and sail in the open Pacific Ocean before entering Prince William Sound. 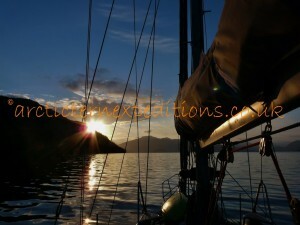 We anchored that first evening at Humpy Cove close to the entrance of Resurrection bay, giving us a head start for what would be an early start to get to Port Bainbridge, trying not to have too much sailing time with small children on board. 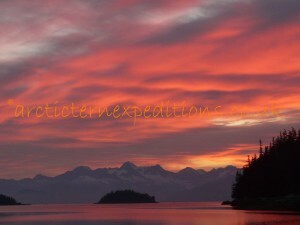 That evening we spotted Eagles, Salmon and a Humpback was blowing just outside the anchorage his spray lit up by the sunset, a fine start to a trip. Next day we started moving while the children were still asleep by the light of a full moon, through Blying Sound with early morning inversion on Sargent Icefield, hoping the sun would burn it off. 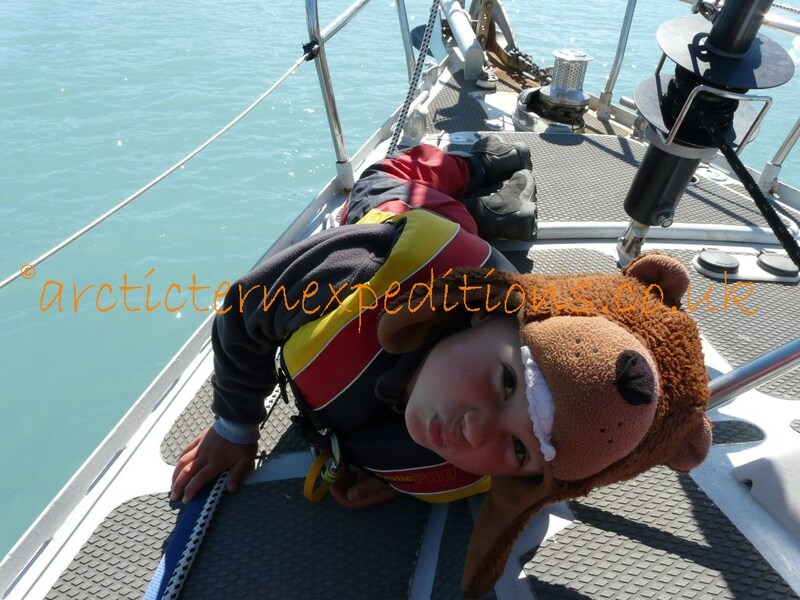 The sun rise was welcome and the warmth was soon felt, the children excited about the holiday, waking up somewhere strange to them they were soon on deck to see where they were, with the Excelsior Glacier slowly being revealed in the distance. Rounding Cape Puget into Port Bainbridge we stopped to investigate Auk Bay, Les thought this might be a good place for Hailbut and Ieuan (aged 7) was excited to go fishing with a rod from a boat. After explaining that the weight had to hit the bottom then be brought back up a metre then jigged, Ieuan took the rod and after two jigs he had a bite and Ali helped him reel in a 17lb Hailbut, if only we had caught Ieuan’s expression on camera when that fish bit, it would have been a fine picture. A little bit of father and son competition then developed and Greg wanted to have a go at this easy fishing! Let’s just say this was the only halibut caught that day! We anchored to have lunch ashore and investigate the beach. After our picnic, we stretched our legs along the shore line picking berries, punctuated with skimming stones, and throwing a newly acquired America football a beautiful sunny lunchtime. 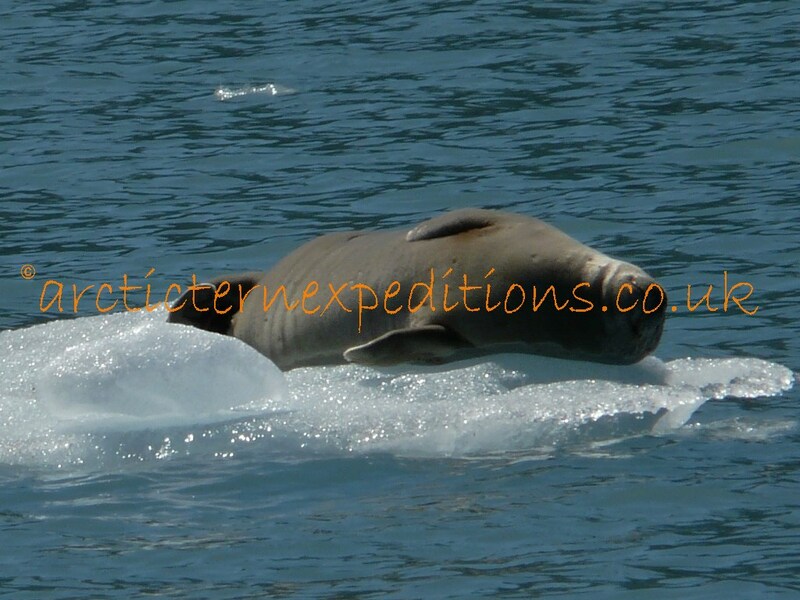 Weighing anchor and motoring up towards Bainbridge Glacier with the hope of visiting the moraine pool by dinghy and kayaks unfortunately the tide was too low making the rapids too dangerous by dinghy, but a little white water kayaking was done in the fast flowing glacial river. The anchorage by the glacier is only a daytime anchorage and we needed to catch the tide to get over the bar into Puffin Cove, where we stayed the night. Next morning again bright sunshine, a trip ashore and a walk was planned. Lunch packed, and containers for berries were taken. Dinghy and kayaks set off for the river, once ashore we spotted lots of bear evidence and felt that walking too far inland wouldn’t be prudent, so we settled for beach combing and berry picking singing bear songs loudly. We continued on the next day round to Whale Bay then Humpback Cove on the way we saw an orca in the distance, we shared this anchorage for the night with a Dutch yacht we met in Seward, the first boat (and people) we had seen since leaving Seward. 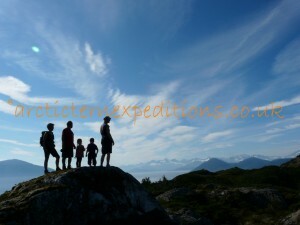 The following day was filled with trips ashore, hiking, beach combing, gunk holing with the kayaks and a spot of fishing. We thought our run of good weather was over but the following morning it was only inversion and as soon as the sun shone brightly it was gone. Revealing the Nassau Glacier calving into the sea with seals basking on the ice floes. That evening we anchored in 7 fathom hole! In Jackpot Bay. A small cove we shared with a small motor boat. 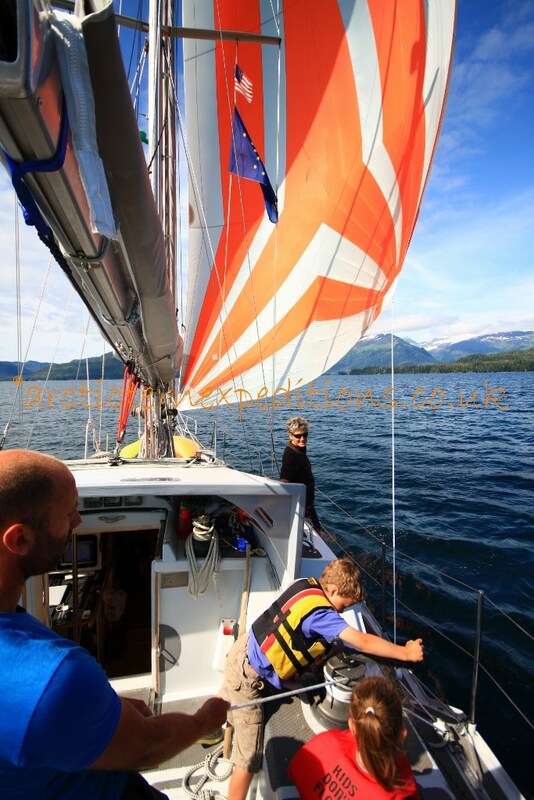 Our sail to East Cove on Perry island was very light winded and an opportunity to launch the cruising chute, unfortunately it didn’t last for long buy we found a super anchorage and were soon ashore for a hike to the top of the hill giving us excellent views across Prince William Sound. We are at the height of Pink Salmon fishing season and our trip to the Hatchery was blocked by a fleet of Purse seiners one after the other hauling nets of salmon on board. 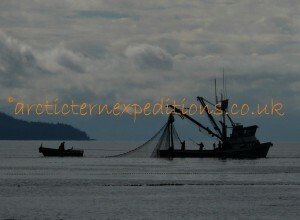 One fishing boat came along side on seeing our Welsh flag and offered to take Greg and the children for a few rounds to see how fishing is done the Alaskan way. They returned with a fillet of king salmon we enjoyed later for our dinner. A trip ashore to on the board walk, berry picking, a swim in the swim hole and a quick look at the hatchery, made for a long but enjoyable day. Lake Bay doesn’t make for a very good anchorage and lots of hatchery traffic so we moved on to Esther Bay for the night. 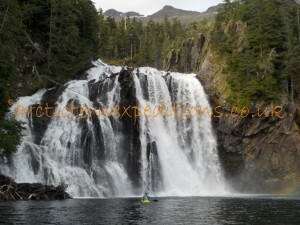 The next day we anchored in Cascade Bay with a super waterfall and hike up to the lake above. We spent the next day sailing to and exploring Olsen Cove, kayaking to Olsen Island looking for evidence of an old fox farm, nothing visible but we watched an eagles nest with young for a while. The next morning we spotted a bear on the beach, catching us by surprise as we were all still in our pyjamas! He wasn’t for hanging about and soon left us so we could get dressed and have breakfast. Unfortunately our spell of good weather ended, the next couple of days were as we were led to believe Alaskan weather was, low cloud and rain and lots of it, but that didn’t stop us exploring, kayaking and indeed sailing, moving Arctic Tern a little closer to Valdez. A local had recommended Long Bay, in kayaks we went right up to the head of the bay in search of bears, eagles, otters and of course salmon. The eagles excelled themselves, along with the salmon, land otters made an appearance but bears seemed to be too shy of us. After a couple of days we left this little oasis for Sawmill bay a state marine park, we had now arrived in civilisation, sharing this anchorage with 9 other boats! Good preparation for our trip the following day into Valdez. A foggy morning greeted us but with the aid of the Garmin HD radar we cruised into Valdez, blue skies above but fog all around, clearing as we entered the harbour. Tying up for the next week as our adventure would now be land based under canvas!